A solution for the future status of Jerusalem is proposed, which fulfills all claims and aspirations of the Israelis and Palestinians, and also leaves the city undivided. The division of cities has hardly ever provided peace over the course of history. It is virtually impossible to give territorial sovereignty over an undivided Jerusalem to two different nations. It might, however, be possible for two different nations to coexist in the same undivided city for the purpose of representing their respective independent sovereignty. It is therefore suggested that Jerusalem should distinguish between “representation of sovereignty” and “territorial sovereignty”: Let Jerusalem become the undivided capital of both, Israelis and Palestinians, with independent representations of their sovereignty in that city, but give the territorial sovereignty over Jerusalem to the people of Jerusalem itself. The proposal is that an independent city of Jerusalem parliament be set up with two chambers: The first chamber should reflect the principle of majority rule for the citizens of Jerusalem, with the second chamber reflecting equal representation of ethnic groups residing in Jerusalem. One seat in the second chamber of Jerusalem’s city parliament should be given to a representative nominated by the United Nations. This proposal for the status of Jerusalem is democratic and peaceful. It could therefore find acceptance and support throughout the democratic world and beyond. Jerusalem is the seat of the President of the State, the Knesset, the Government and the Supreme Court. The Holy Places shall be protected from desecration and any other violation and from anything likely to violate the freedom of access of the members of the different religions to the places sacred to them or their feelings towards those places. A proposal for the status of Jerusalem is described below (Hueck, September 27, 2000). The proposal draws on the idea of balancing power and uniting the people in such a way that the claims and aspirations of the different parties are fulfilled to the greatest extent, including freedom of access to the sacred places of the different religions. One aspect of sovereignty relates to control over the territory, economy, and police as well as over law, jurisdiction, and administration. Two authorities can not share this territorial sovereignty. Another aspect is the representation of sovereignty. This involves, for example, the seat of the president, parliament, government, and supreme court as well as flying of the national flag. Two authorities can coexist in the representation of their sovereignty. Within an undivided Jerusalem Israelis and Palestinians could therefore both represent their independent sovereignty as outlined above. This would allow calling Jerusalem the capital of Israel and at the same time the capital of Palestine. It is proposed to transfer the territorial sovereignty over Jerusalem to the people of Jerusalem. 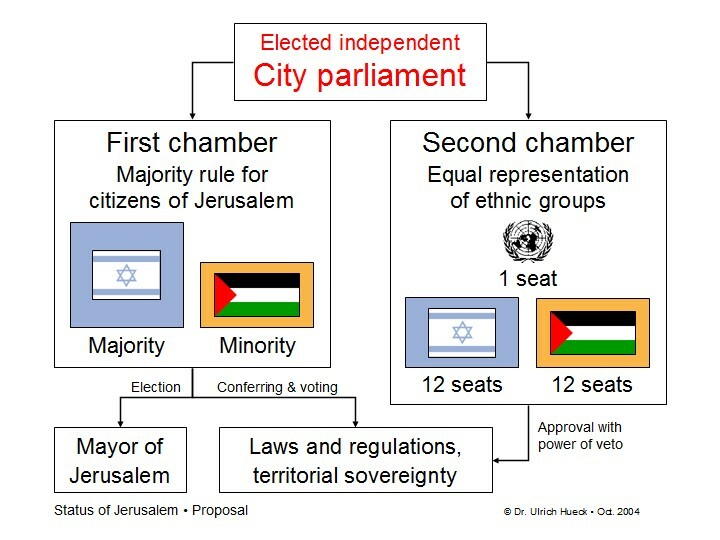 They shall elect an independent city parliament with two chambers as depicted in Figure 1. This city parliament shall maintain control over the territory, economy, and police as well as over law, jurisdiction, and the administration in Jerusalem. The members of the first chamber of the city parliament shall be appointed through majority rule. These representatives elect the mayor of Jerusalem. Furthermore, they confer and vote on laws and regulations concerning the city of Jerusalem. 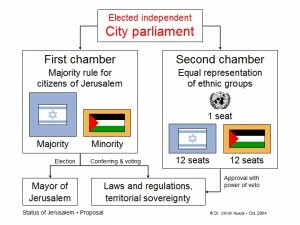 The second chamber shall reflect equal representation of the two main ethnic groups in Jerusalem. For example, the Jewish majority and Palestinian minority shall both appoint 12 seats. A representative of the United Nations shall take an additional seat in the second chamber of the city parliament. The second chamber shall approve laws and regulations for the city of Jerusalem, and it shall have the power of veto concerning acts of the first chamber. To date, Jerusalem’s City Council has one chamber with 30 members, in addition to the mayor, who is directly elected. Any resident of the city may run for office and vote in the municipal elections (Jerusalem Municipality, 2003). A particular clause shall exclude anyone from residing in Jerusalem, who attempts to violate or abolish the city’s peaceful democratic status. The described proposal for the status of Jerusalem is democratic, peaceful, amazingly simple, theoretically sound and implementable. Israelis and Palestinians can benefit from the support that the proposal will find in the entire democratic world. The practical implementation of the proposal requires that the negotiating parties show interest in considering the idea, further illustrative presentation and publication, political support from inside and outside of Israel and Palestine, as well as emphatic discussion and fair negotiations, whereas details of the proposal could be carefully adjusted. The proposal “Balance the power – Unite the people” can lead to a profound and lasting agreement on the status of an undivided Jerusalem. It will contribute to the safety and security of people in the Middle East and beyond. Knowlton B. (July 26, 2000). Mideast Peace Talks Collapse. International Herald Tribune.